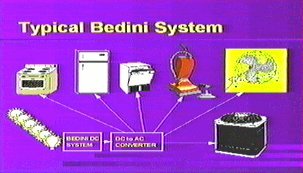 We at Bedini Technology, Inc. have developed energy systems for many years, since the early 1970's. We have openly shared many of these discoveries on the pages of this website since the beginning of the internet. Due to recent events, it is becoming increasingly clear that a growing number of people are using ideas from this website, and infringing on my patents without even the courtesy of giving me credit. 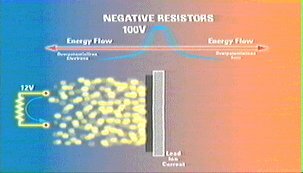 We will explain the BTI negative resistor process for taking extra energy from the vacuum. For simplicity, the process will be produced in a common lead acid storage battery. First we will explain the necessary background to understand this process. An open thermodynamic system such as a windmill receives energy from its active environment. Such a system can change its own potential energy as more wind energy is received. It can also power itself and a load such as a pump to provide water. The open system can re-order itself. It can self-oscillate or self-rotate. It can output more energy than the operator inputs, because the environment furnishes extra energy. Like the windmill, it can power itself and its load simultaneously. It exhibits what is called “negentropy”. That is, it increases its energy as it receives more energy from its environment. For example, the windmill increases its energy as the wind blows more strongly. To relate to electrical systems, we can regard the windmill as a “negative resistor” since it accepts unusable wind energy from the environment and transforms it to shaft horsepower to power the load (the pump). 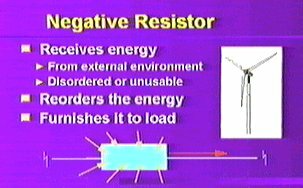 In other words, a negative resistor receives energy from the environment in a form not usable by the working load. 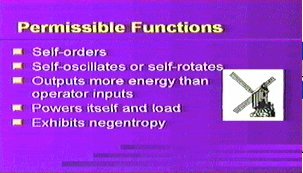 It transducers the energy into usable form by re-ordering it, and then furnishes the usable energy to the load to power it and do work for us. For over 100 years, conventional electrical systems have been designed as equilibrium systems. They are symmetrical with their active vacuum environment. They give right back to the vacuum any energy they receive from it. With those systems we have to put in all the energy we get out and use. We must also input some additional energy to cover losses in the system. The ratio of output to input is less than one. We say that these systems have a coefficient of performance or COP less than one. We also refer to them as “underunity” systems. Nearly 50 years ago, particle physicists discovered that the symmetry of an electrical system with the active vacuum can be broken. So a sort of “windmill” electrical system, in a vacuum energy wind, is permitted. 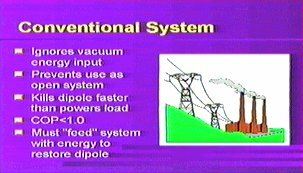 Such a system would be powered by vacuum energy. 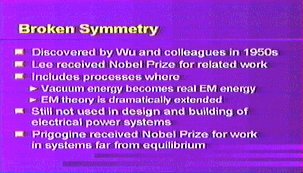 Wu and his colleagues, and Lee as well, received Nobel Prizes for this and related work. Prigogine later received a Nobel Prize for his contributions to such systems. However, electrical engineers still design power systems with a 136 year old EM theory which has not been changed. The theory does not include extracting and using electrical energy from the active vacuum. Our engineers continue to design power systems the old way. Any dipole is a broken symmetry in the vacuum energy flux. So the common dipole – simply separating positive and negative charges – provides a negative resistor. The potential (i.e., voltage) between the two ends is a novel energy flow circulation, as shown by Whittaker in 1903. Energy from the vacuum – in the complex plane or what the engineer calls “reactive power” – is continually absorbed by the charges on the ends of the dipole. The charges transduce the absorbed reactive power is into real electrical power, which then pours out from the dipole in all directions. This gushing energy from the vacuum will continue while the dipole lasts. We only have to “pay” once, for initially making the dipole. For example, dipoles in ordinary matter have been pouring out energy extracted from the vacuum, for some 15 billion years. Batteries and generators do not power their attached circuits! They expend their available internal energy (shaft energy input to the generator, and chemical energy in the battery) to force their own internal charges apart, making a source dipole. That is ALL that batteries and generators do. They do not place a single watt of power on the external circuit, nor do they power any load. 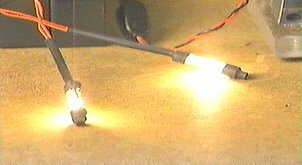 Instead, from Whittaker’s work in 1903, the dipole receives vacuum energy (reactive power), transduces it into real power, and continuously pours out that energy along the circuit, filling all space. The circuit intercepts a tiny bit of that energy flow, and powers the load. Every electrical load and circuit is powered by electrical energy extracted from the vacuum. All electrical loads are powered by vacuum energy today. All the hydrocarbons ever burned, all the fuel rods ever used, all the dams ever built to turn generator shafts, etc. have not added a single watt to the power line. All that enormous effort has done nothing but make power system dipoles. Sadly, our engineers have always made systems so they kill the dipole faster than they can power their loads. So with these archaic systems we have to continue to burn fuel, build nuclear power plants, etc. 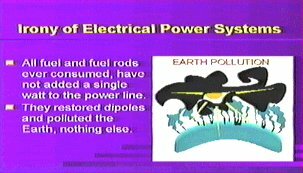 just to remake the dipoles our systems continually destroy. Simply put, that is not the way to run the railroad. The Bedini process repeatedly produces a negative resistor inside a battery or other energy storage device for free, or nearly so. Once the negative resistor is momentarily established, a blast of energy leaps from the vacuum onto the charges in the battery and onto the charges in the circuit, which are flash charged with excess energy. The battery is recharged and the load is powered simultaneously. 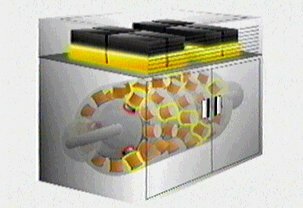 The Bedini process repeatedly produces a negative resistor inside a battery or other energy storage device for free, or nearly so. 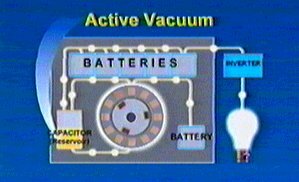 Once the negative resistor is momentarily established, the energy leaps from the vacuum onto the battery, which are charged with excess energy. The battery is recharged and the load is powered simultaneously. A typical system approach is to power the system from one battery, while a second battery or group of them is on “charge” from the negative resistor process. Then the powering battery is switched and the load powered from another one, so that the original battery can be charged very rapidly. Iteration keeps all batteries charged while continuing to fully power the load. A typical DC output may be converted into standard AC in an ordinary DC-to-AC converter, e.g. to power one’s home. The Bedini process will give birth to very different, decentralized electrical power systems taking their electrical energy directly from the local active vacuum. We illustrate the enormous amount of energy that any dipole actually converts from the vacuum and outputs. Here is one of the conductors (wires) attached to one terminal of a generator or battery. A large wave flow surrounds the wire, out to an infinite radial distance. This shows the enormous energy flow that is pouring out of the terminals. This is real EM power. As can be seen, most of it misses the circuit entirely and is just wasted. 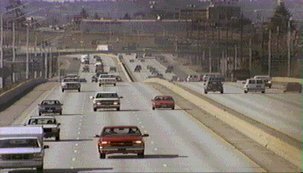 In the wire, we see the free electrons bouncing around, coming to the surface, and intercepting a tiny bit of the passing energy flow – much like placing your hand out of the window of a moving car and diverting some of the passing air flow into the interior. In this wire, only that tiny, tiny bit of energy flow deflected into the wire is used to power the electrons, produce current, and power the circuit. As you can see, every circuit has always been powered by the little bit it is able to catch from an enormous passing energy flow. The entire large energy flow is extracted from the vacuum by the source dipole and poured out of the terminals. In this animation we show how the energy is received by the dipole from the vacuum as reactive power. The charges then transform their absorbed energy into real usable power and pour it out profusely. An enormous flow of real EM energy results. 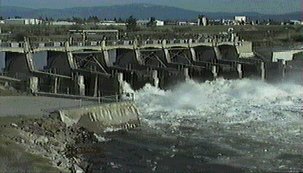 We must now have a circuit which intercepts and collects some of that huge, gushing energy flow, and dissipates the collected energy in loads. 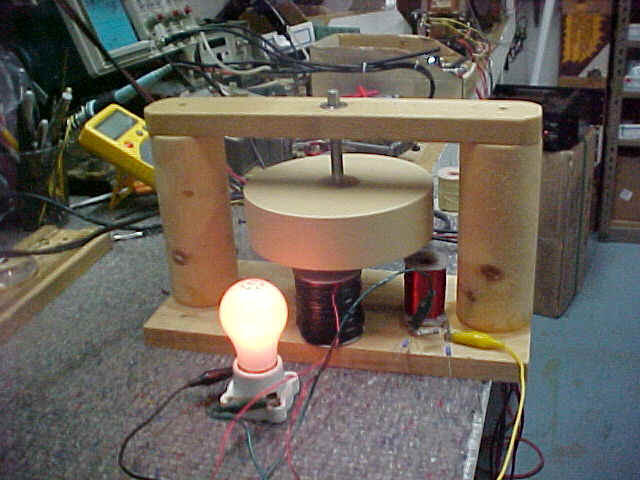 As can be seen, if we make the dipole stronger, we increase the energy flow. If we diminish and destroy the dipole, we diminish and then destroy the gushing EM energy from the vacuum. So then we must pay to restore the dipole. 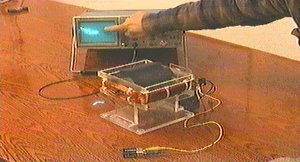 This animation shows how the Bedini process in a battery forms a negative resistor, which extracts and furnishes vacuum energy. The electron current can only move between the outside of the plates out into and through the external circuit. Between the plates, a very heavy lead ion current sluggishly moves. A pulse of electrons piles immediately up on the edge of the plates, trying to push the lead ions in charging mode. The ions move very slowly, so that electrons continue to pile up. The density of the electron pileup produces a sudden large potential – a dipolarity. As we showed, this dipolarity produces a sudden blast of much-increased EM energy flow across the ions, adding much greater energy to them. At the same time, the blast of EM energy also travels out into the external circuit, driving the electrons to power the load. In short, momentarily this 12-volt circuit has been freely converted to a 100-volt circuit. Its available power has been increased by a factor of 8 or more. As the pulse of electron pile-up potential is cut off, the well-known Lenz law reaction is evoked. This momentarily squeezes the electron pileup even more, suddenly raising the voltage to 400 volts. This further increases the available power by an additional factor of 4 or more. So the circuit now has some 32 or more times as much power as it initially had from the battery alone. The collection of the excess energy from the “charging” of the overpotential occurs on the ions charging the battery, and also on the external circuit electrons powering the load. The system has been blasted open and is receiving a great surge of energy from the vacuum. It receives this excess energy from the dipole acting as a true negative resistor. 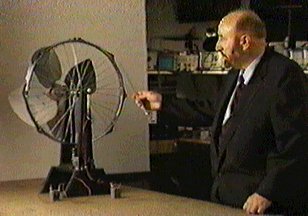 As an analogy, we have converted the system into a sort of “windmill” and triggered the vacuum into providing a very powerful set of wind-blasts to power the windmill. 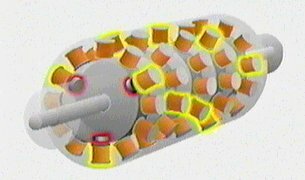 This animation shows the operation of a typical Bedini power system driving a rotary motor (center) and charging a bank of batteries (top) from a battery (left side). The negative resistor process (shown by the bubbles) in the battery at the left is continually triggered. The “energy” is used to further trigger the negative resistor process in each battery in the bank at the top. An AC to DC inverter is connected to the battery bank, so that standard AC power is output to the normal electrical wiring system of the house, office, etc. As can be seen, the battery and charging systems are used to extract excess energy from the vacuum, convert it to usable DC form, and collect it. 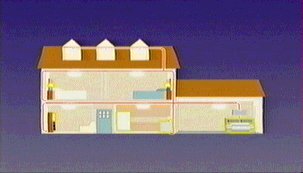 Then the converter changes it to proper AC form to power the house AC, while simultaneously the motor is being powered. In addition, the precise timing and switching for the charging of the system with vacuum energy is mechanically built into a motor system . This animation shows how the motor/timer/switcher can be arranged in banks to dramatically increase the shaft horsepower. At the same time, additional banks of batteries or other accumulators can be continually charged, so that an entire neighborhood or a large office building can be powered by the system’s larger AC converter not shown. The output can power any shaft horsepower load required. 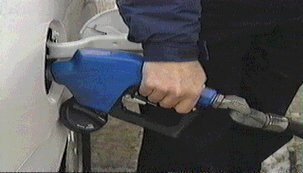 In the future, an adaptation of this approach can power transport vehicles such as automobiles, trucks, trains, boats, etc. This automation shows a typical home with an installed Bedini power system. Here the batteries are utilized as negative resistors and accumulators. A standard DC to AC converter is also powered, so that standard AC power is furnished to the main power panel of the home. All the usual home appliances and loads are powered in normal fashion. This home is immune to power outages from storms, blown transformers, substation failures, brownouts, or blackouts. Everything is powered by electrical energy obtained directly from the active vacuum. In this segment we show an actual lab test model that demonstrates the principles of the Bedini process. The main battery is here (point) and you can see the motor here. 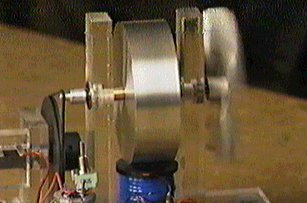 The motor is doing work by operating a fan blade and pumping air. Accumulators are located here (point) in which energy from the proprietary Bedini transformer (point) is being cumulatively collected eight times for each revolution. Once per revolution, precise switching (point) discharging of the accumulator transformer into the secondary battery (point) to charge it. In this arrangement, we show proof of principle by continuously doing work (pumping air) while continuously keeping the secondary battery charged. Periodically the batteries are switched and the former primary battery is charged. The excess energy comes directly from the active vacuum, through the negative resistor in the battery created by the Bedini process. In addition, we are demonstrating additional energy being obtained from excess collection in the transformer (point) eight times per rotation, and fed into the battery once per revolution to recharge the secondary battery. Another principle shown by this system is the superpolarity of the magnetic motor (point). The magnets all have north poles pointing outward. The compression and repulsion in the middle of any two poles creates a north pole whose field strength is several times larger than the field strength from each magnet. Thus we have formed eight “phantom poles”, to dramatically increase the field energy density in the magnetic field where the special transformer (point) collects additional energy (from the superpole flux cutting one of the coils, eight times per revolution of the rotor. The energy is collected in a accumulator transformer (point) and once per revolution it charges the secondary battery . 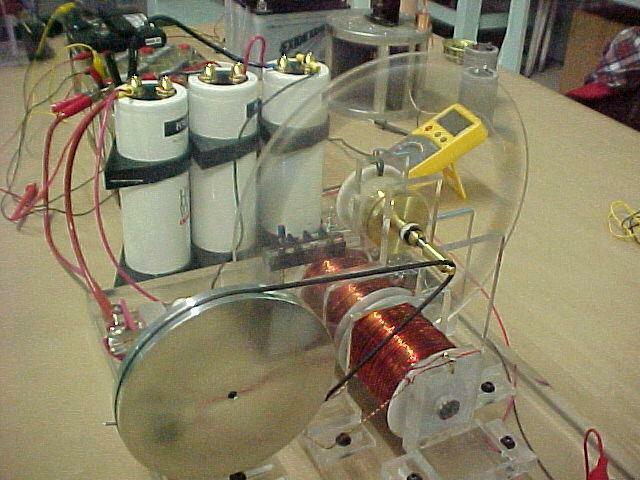 The system demonstrates that the vacuum energy can be collected in several places and in different ways, collected in a proprietary accumulator transformer, and then used to very powerfully form a sudden negative resistor in the battery (point). This charges the battery with additional energy from the vacuum as previously explained. The electrical energy needs of the world are increasing exponentially. At the same time, the world’s oil supplies are peaking and will be gradually decreasing, while becoming ever more expensive to obtain. The easily foreseeable result is first a world energy crisis, now looming, followed by a world economic crisis as prices of transportation, goods, etc. increases. The Bedini Negative resistor process can resolve this crisis that is coming upon us. With Bedini systems and technology, the increasing need for oil can be blunted and controlled, so that the economy levels off while at the same time additional electrical power is provided as needed. BTI is currently working on additional designs that will produce more power on demand and quite flexibly. These systems are adaptable to almost any electrical power system application, from pumping water, powering high speed turbines, etc. The potential for replacing almost every inefficient electrical motor with regenerative systems is obvious. Most industrial and consumer applications can be met by Bedini systems, more economically, cleaner, cheaper, and far more efficiently. Compared to other systems, a BTI power system will always use less and produce more in the same application, and do it cleanly and without pollution. The company has been granted patent protection and the Bedini processes are patented . Worldwide protection is in process and will be diligently maintained during the patent process. BTI will also be filing many additional patents as the technology further develops to extend and complement the two processes. You have witnessed what we at BTI believe to be the dawn of a revolutionary new age of efficient and clean electric power. Producing energy at a fraction of its present cost, dependably and reliably, and doing it easily and anywhere, will revolutionize the present systems with their wastes and pollution. 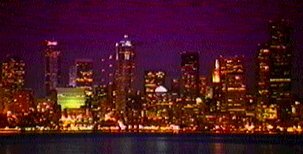 The BTI power systems will provide a never-ending source for electrical power and energy so desperately needed by all the peoples and nations of the earth. Providing and maintaining a secure, safe, clean future of plentiful electrical power is our goal and hopefully yours as well. We at Bedini Technology, Inc. wishes to thank you for viewing our scrolling presentation. Please view our main page for further information. In the paper " The Final Secret of Free Energy " wrote in February 9, 1993, Tom Bearden has described the principle of a device which seems able to tap Free Energy from the energy flow ( the Poynting S-Flow ) in the vaccum during the short transient phase ( the relaxation time in a conductor ) when a source is connected to a resistive load. In this paper, I am trying to clarify a bit, the basic concept of this principle. Tom Bearden claims that when a Source ( a dipole ) is connected to a resistive load, the most important part of the principle is the information transfered to the load at the speed of light by the S-Flow. 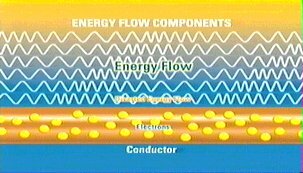 The S-Flow is pure EM energy which flows through the space and outside the conductor. This energy is Free and only this part must be used as a "free lunch". Just after this very short time, after that the switch is closed ( the transient phase ), the current begins to flow in the circuit. This transient phase is named the Relaxation Time. In copper, the relaxation time is incredibly rapid, it's about 1.5 x 10-19 sec. When the current flows ( the permanent phase ), the circuit consumes power from the Source and dissipates energy by Joule's Effet, this phase must not be used in our case. 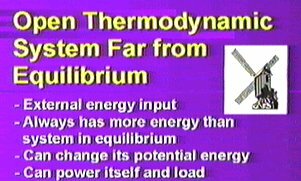 So, according to Tom Bearden, for tapping Free Energy, the purpose is to charge a " Collector " during its relaxation time and then, to switch this Collector to a common resistive load, just before that the electrons begin to flow in the circuit. << We took some trapped EM energy density (a chunk of potential gradient, a "voltage" before current flows) from the source, by switching that potential gradient (energy density, which is joules per coulomb) onto a collector (containing a certain number of coulombs of trapped charges) where the potential gradient activates/potentializes/couples-to these temporarily non translating electrons. So the finite collector collected a finite amount of excess energy [joules/coulomb x collecting (trapped) coulombs] on its now-excited (activated) free electrons. Then, before any current has yet flowed from the source, we switched that potentialized collector (with its temporarily restrained but potentialized electrons; with their finite amount of excess trapped EM energy) away from the source and directly across the load. Shortly thereafter, the relaxation time in the collector expires. The potentialized electrons in the collector are freed to move in the external load circuit, consisting of the collector and the load, and so they do so. >> has said Tom Bearden. For the Collector it is necessary to use a conductive material which has a longer relaxation time than in the copper. This is only for the electronic circuit design and the limitation of its components. So, Tom Bearden has used " a Degenerate Semiconductor " which has a relaxation time of about 1 ms. The Collector is made with 98% Aluminum and 2% Iron. I only have time every so many weeks to try to answer such questions. beside standard classical electrodynamics and electrical engineering. in the "Well, it's not in conventional EE, so I can't understand it"
the standard EE does not adequately describe nature. are the fruitful discussions of the methods for doing those two things? understand CEM or electrical engineering! for publication in the proceedings. thousand times greater) than the mass per unit charge of the electrons. transmission line. It doesn't sit there like a "scalar" entity at all! delivered to the ions in charging mode. It's as simple as that. absolutely no difficulty in reproducing the Bedini process in the 1980s. Neither did Jim Watson, who later developed and demonstrated an 8 KW device. 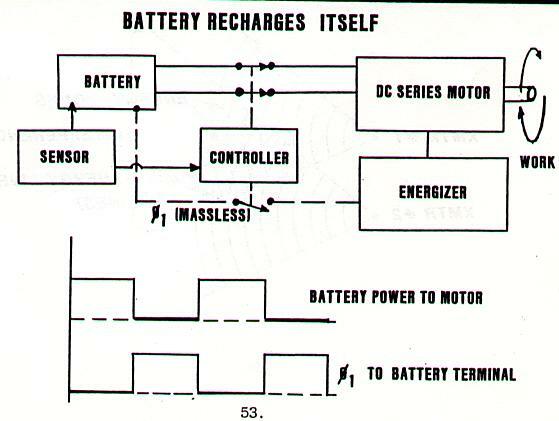 the external circuits to "push the charges" in the other direction. circuit --- in powering direction. the potential energy of any Maxwellian system can be freely changed at will. energy" in the system, and that is all. external circuit to push electrons in powering mode. understands it or one doesn't. both, and potentialize them both simultaneously with the same potential. HOW MUCH EXCESS ENERGY YOU CATCH IN BOTH DIRECTIONS DEPENDS SOLELY ON THE MAGNITUDE OF THE PHI AND THE MAGNITUDE OF THE Q's. 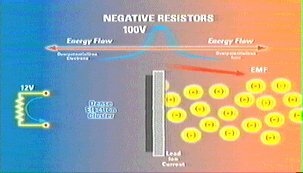 system or true negative resistor is TO GET OUT OF CLASSICAL ELECTRODYNAMICS AND ELECTRICAL ENGINEERING. If one cannot think outside those boxes, one will never get or understand overunity, because IT IS COMPLETELY OUTSIDE THOSE TWO BOXES. purest and most definitive (and easily demonstrated experimentally) kind. reprove that; it's been proven in physics since 1957. Microphysics, University of Chicago Press, Chicago and London, 1985, p.
century that all static EM fields and potentials are in fact "static"
fields of Van Flandern's second kind --- analogous to an unfrozen waterfall. longitudinal waves inside (and comprising) all EM fields and potentials. and in the literature since 1903.
static field as a "frozen waterfall" analogy. charge, much less a broken symmetry in that exchange. So they do not even model what powers every electrical circuit. Period. and Yang in that same year, in Dec. 1957 -- a nearly unprecedented action. broken symmetry means for the source charge and the source dipole. Voila! the seething vacuum via the asymmetry of the source charge or dipole. department, professor, and textbook today, and it always has been. energy out of nothing. Poetic justice. order in the first place, to SUBSEQUENTLY disorder. negentropy (order) that is later disordered in entropic processes. electrolyte experiments at U.S. Naval research facilities at China Lake. second law does still irrevocably apply to MACROSCOPIC phenomena and size. "run backwards" at up to micron (colloidal) scale, and for up to TWO SECONDS. is Steven K. Blau, "The Unusual Thermodynamics of Microscopic Systems,"
dogma used in the comments. average energy at each point depends on the temperature at the boundaries. long times (as compared to characteristic relaxation times). ...non-equilibrium processes may have 'long time-tails'...". to include (hopefully) some kind of explanation for these areas. has been filled with perfectly ordered EM energy from that source charge. ordered fields and potentials reach across the entire observable universe. of thermodynamics, and TO ANY MACROSCOPIC SIZE LEVEL ONE WISHES, INCLUDING ACROSS THE ENTIRE UNIVERSE when one accounts the perfect and continually increasing order of the fields and potentials and their energy. extracted from the vacuum via the source charge's broken symmetry). points out the solution sitting there in particle physics. departments. It outputs 18 or so times as much energy as one inputs. that long-neglected component, by a Bohren-type experiment. See Craig F.
such particles and insulating particles at infrared frequencies are another. than the light incident on it? '}," Am. J. Phys., 51(4), Apr. 1983, p. 327. The Bohren experiment is repeatable and produces COP = 18.
with every field/charge and potential/charge interaction. John Bedini and Thomas Bearden Have been working on these systems now for over 30 years. One is driving his car and keeps crossing the same river over and over. Then the light bulb in your head goes on, he begins to think what does this mean? It's "Natures Open System". The very next thing to do is to stick a paddlewheel into the river, this is where we stop for we have just created a open system to the paddlewheel, everything from the shaft to the generator to your load is now in a closed path, but the river is "FREE" and "OPEN" What Electrical Engineers do is take the output of the river and bring it back to the input of the river and then pump the hell out of the paddlewheel to keep the river moving. "This is called closing the loop". With this type of system you can NEVER GET A >COP of 1 or BETTER<. The source is " Natures Open System" . "You walk around in this system every day and fail to see how it works". What does this mean for electrical circuits, It Means you can never collect anything that you do not pay for, for you are forever pumping that river. The Universe is a open system, a continually running river. All you must do is find where to put the paddlewheel and not close the loop. Kron, Gabriel. “Now a value E of the negative resistances, at which the generator current becomes zero, represents a state at which the circuit is self-supporting and has a continuous existence of its own without the presence of the generator, as the negative resistances just supply the energy consumed by the positive resistances. (If the circuit contains inductors and capacitors, the circuit is a resonant circuit and it oscillates at its basic frequency.) 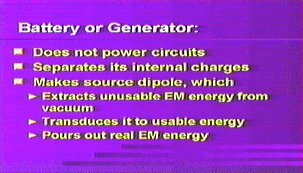 … When the generator current is positive the circuit draws energy from the source, and when the current is negative the circuit pumps back energy into the source. At zero generator current the circuit neither gives nor takes energy, and theoretically the generator may be removed.” Gabriel Kron, “Electric circuit models of the Schrödinger equation,” Phys. Rev. 67(1-2), Jan. 1 and 15, 1945, p. 41. Kron, Gabriel. "...the missing concept of "open-paths" (the dual of "closed-paths") was discovered, in which currents could be made to flow in branches that lie between any set of two nodes. (Previously — following Maxwell — engineers tied all of their open-paths to a single datum-point, the 'ground'). That discovery of open-paths established a second rectangular transformation matrix... which created 'lamellar' currents..." "A network with the simultaneous presence of both closed and open paths was the answer to the author's years-long search." Gabriel Kron, "The Frustrating Search for a Geometrical Model of Electrodynamic Networks," Journal unk., issue unk., circa 1962, p. 111-128. The quote is from p. 114. Kron, Gabriel. . "When only positive and negative real numbers exist, it is customary to replace a positive resistance by an inductance and a negative resistance by a capacitor (since none or only a few negative resistances exist on practical network analyzers.)" Gabriel Kron, "Numerical solution of ordinary and partial differential equations by means of equivalent circuits." Journal of Applied Physics, Vol. 16, Mar. 1945a, p. 173. When the generator current becomes zero the circuit is self-supporting as the negative resistances just supply the energy consumed by the positive resistances. When the generator current is positive the circuit draws energy from the source, and when the current is negative the circuit pumps back energy into the source this is known as” open-paths” and “closed-paths”. That discovery of open-paths established a second rectangular transformation matrix... which created 'lamellar' currents. This circuit uses positive resistance by an inductance and a negative resistance by a capacitor. I must stop right here and say, Thomas Bearden and I have been friends for 20 years during this time we have been the best of friends through thick and thin, and I always will be Tom's friend forever.You only in your life time have two or three friends that you can trust with your life and Thomas Bearden is the one. I enjoyed building everything on the bench that had to do with Tom's theories, and with a little work "THEY WORK". But you must learn how to think out side the box. As to this day Tom and I always keep discussing this field, and it will never end. 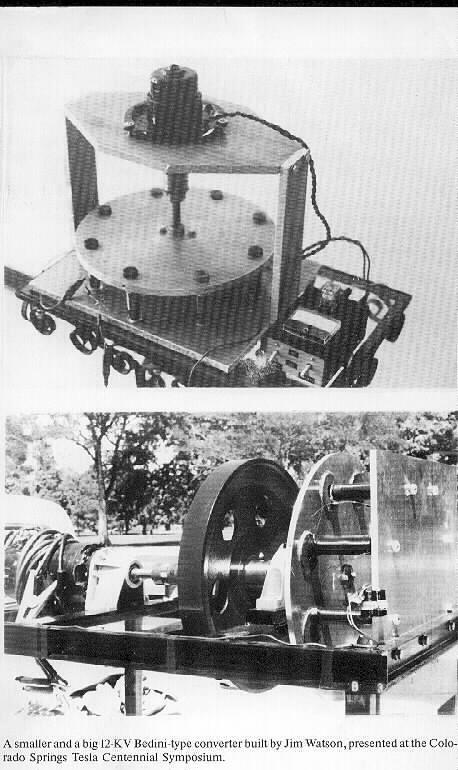 The Year was 1983," So you do not know your history"
On this slide, we show a theoretical scheme which several researchers have discovered and used to build simple free energy motors. In this scheme, we drive an ordinary d.c. series motor by a two wire system from an ordinary battery. The motor produces shaft horsepower, at – say – some 30 or 40 percent efficiency, compared to the power drained from the battery. This much of the circuit is perfectly ordinary. The inventors who have discovered this have used various variations, but here we show a common one. If things are built properly, the battery can be made to more than recover its charge during this pulse cycle. To prevent excess charge of the battery and overheating and destroying it, a sensor is added which senses the state of charge of the battery, and furnishes a feedback signal to the controller to regulate the length of recharge time per “power off” pulse. In other words, the system is not self-regulating. The relation between power pulses and recharge pulses is shown on the graphs at the bottom. Note that regulation may decrease the time of recharge application of the del-phi river. This system, if properly built and tuned, will furnish “free shaft energy” continually, without violating conservation of anenergy. Remember that the del-phi condition across the battery terminals means that space-time is suddenly curved there, and conservation of energy need no longer apply.